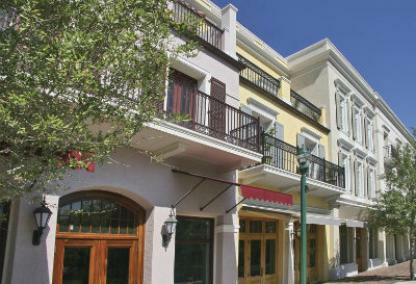 Located just north of downtown Sarasota on Orange Avenue, Citrus Square is a newer mixed-use condominium development with retail and residential units. Built in 2009, the ground floor consists of retail shops while the upper two levels are one and two bedroom condos. Standard options for these condos include solid-core doors, crown molding and premium trim work. Floor plans include 1 to 2 bedrooms and range in size from 644 to 1,176 square feet. Maintenance fees are very reasonable at only $289 per month. This is one of the lowest monthly fees in downtown Sarasota market and includes all exterior maintenance, reserves and hazard insurance. Address: 445 N. Orange Ave.
Citrus Square is located three blocks north of Main Street on Orange Avenue. It is only a short distance from the heart of the city. Enjoy easy walks to the Selby Library, shops, art galleries and restaurants. In addition, it is only a short drive to the Sarasota's bayfront, beaches and St Armands Circle.